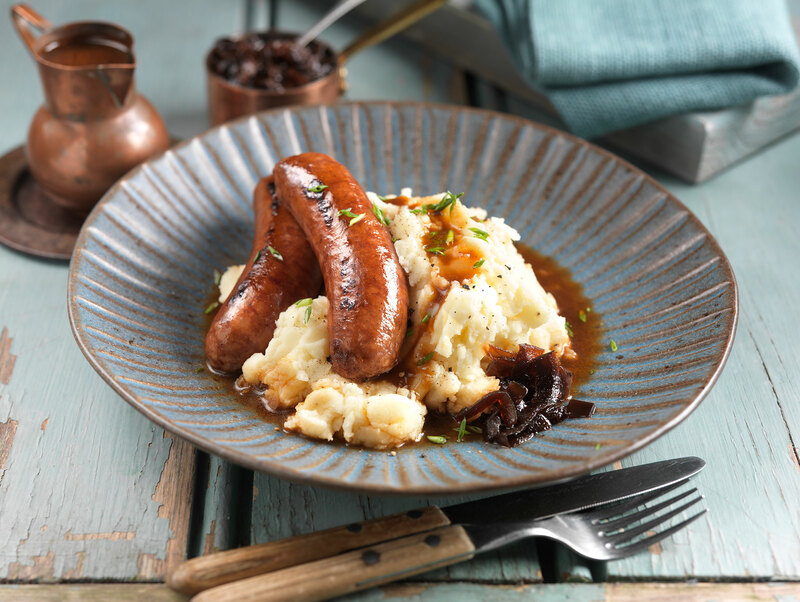 Enticing Sausages and Mash - A real winter warmer! 1.Heat a pan with some oil and gently colour the sausages until nice and brown turning every 2 minutes and cook for about 12 minutes. 2.Meanwhile heat the mash according to the instructions adding cream and butter according to taste. 3.In a pan gently heat the red wine sauce, whisking in a knob of butter to give the sauce a nice shine. 4.Either in a pan or microwave heat the onion marmalade until hot. 5.To serve place the mash in the centre of the plate and arrange the sausages neatly on top of the mash. 6.Place the onion marmalade on top of the sausages then pour over the red wine sauce. 7.Garnish with the sprigs of rosemary.